WHO MADE THE FIRST SHORT-FOOTAGE FILM SPECIFICALLY REDARDING A SONG? MARIO ALMIRANTE IN 1930 FOR ‘NINNA NANNA DELLE DODICI MAMME’ (THE LULLABYE OF TWELVE MOTHERS) BY ODOARDO SPADARO. WHO ACTUALLY FILMED THE FIRST SHORT FOOTAGE PROMOTIONAL COLOR FILM? 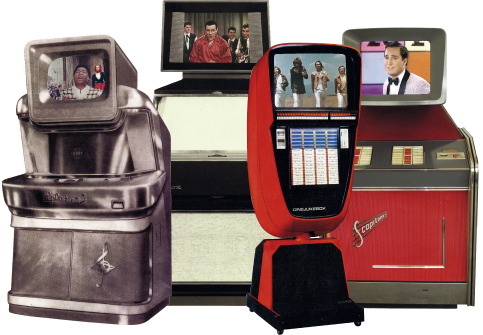 DOMENICO PAOLELLA FOR ALTAGRACIA’ BY DON MARINO BARRETO JUNIOR, A MUSIC VIDEO MADE FOR THE CINEBOX WHICH WAS A JUKE-BOX WITH A SCREEN FOR PROJECTING VIDEOS INVENTED IN ITALY AND PRESENTED TO THE PUBLIC IN APRIL 1959 BY VITTORIO DE SICA. WHO WAS THE AUTHOR OF THE FIRST NEW GENERATION MUSIC VIDEO? RUGGERO MITI WHO IMMORTALIZED LUCIO BATTISTI IN THE WOODS OF THE BRIANZA, A DISTRICT IN ITALY SINGING THE SONG ‘ANCORA TU’ (YOU AGAIN). WHO WAS THE FIRST TO FILM AN ENTIRE ALBUM OF SONGS? POMPEO DE ANGELIS IN 1973 WITH ‘GIRA CHE TI RIGIRA AMORE BELLO’ (TURN AND BE TURNED MY HANDSOME LOVE) DI CLAUDIO BAGLIONI. A televised documentary that researched and documented the firstborn of the various music videos, was Tg2 Dossier entitled ‘Generazione De Sica, canzoni da guardare’ (The De Sica generation, songs to see)) by Michele Bovi. It was a journey through a century of popular light hearted melodic or light-music films often with popular singers, as the main protagonist. only to find that many prestigious names of the world of culture and cinema had worked in this genre of ‘Musicarelli’ films (popular light hearted melodic or light-music films often with popular singers, as main protagonist). from Ettore Scola to Nanni Loy, from Ennio Flaiano to Antonio Ghirelli, from Ugo Pirro to Cesare Zavattini. With testimonials of Italian and International artists and film directors plus an interview with Francis Ford Coppola who, when young, was involved in the production of the Scopitone, the French competitor of the Italian Cinebox: in this venture the future director of ‘The Godfather’ lost quite a large sum of money. Four artists that appeared in the music videos of the Cinebox. 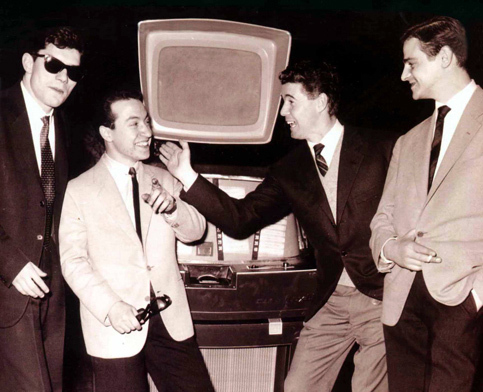 From left to right: Luigi Tenco, Ricky Gianco, Joe Sentieri, Sergio Endrigo (Milan. Italy 1962).